This entry was posted in Hilarity of the Week, polls and tagged fun polls, funny facebook comments, funny facebook comments october 2016, funny facebook posts, funny facebook shares, funny people online, hilarity of the week, polls to vote on, vote polls. Funny Facebook Comments for the Week of October 3rd, 2016. This entry was posted in Fun & Games, Hilarity of the Week and tagged facebook funnies, facebook shares, funny comments, funny comments online, funny facebook comments, funny people online, hilarious people, hilarity of the week, things that make me laugh. 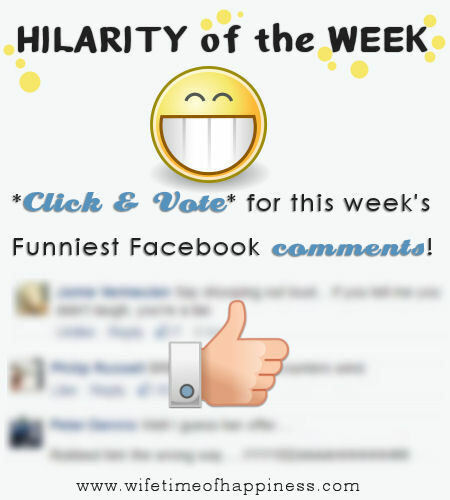 Come on inside to *VOTE* for your favorite funny comment and find out last week's winner! This entry was posted in Fun & Games, Hilarity of the Week and tagged fun voting poll, funny comments, funny comments online, funny facebook comments, funny people online, hilarious people, hilarity of the week, PR Friendly Blog, ryan lochte, scary spider, uber, uber rides, voting polls.